Viby, near Hindsholm, Funen, is regarded as one of Denmark's best preserved villages - and with good reason. 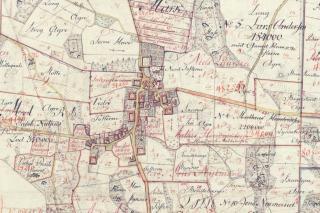 Anyone interested in seeing what a village from the era of tenant farmers and landlords was like should head to Viby. Many of the meticulously restored farms are listed, as is the windmill and the hospital. Viby Parish has established its own historical preservation society. The windmill is owned and operated by a volunteer association. Viby is a road cluster village", because its farms are placed along its winding main thoroughfare, extending out from the 13th century church. Viby, and its stone walls, half-timbering, thatch and flowers, served as the model for the Funen Village open-air museum. " Viby was owned by the neighbouring manors of Broløkke and Hverringe. The farms are now all part of the Hverringe estate, which also encompasses Viby. Buried in the idyllic village church, which features a half-timbered tower, are the owners of Broløkke. Hverringe Manor has since added a burial chapel with a domed copper roof. Just across from the church lies the village hospital, built by Broløkke Manor around 1780. The hospital was home for the old, the sick and the poor who had served the estate. The hospital had four small single-room flats. The area around Hverringe and Broløkke, which stretches to Kerteminde Bay, is considered some of the most beautiful countryside in Denmark and is today a nature preserve. Also a part of the manor and the parish is the island of Romsø, which is left untouched as a natural forest.